Like a tired god who hasn’t had his apple a day, Sven-Eric Bechtolf’s bargain-basement Ring trudged back onto the Wiener Staatsoper’s stage last night. You could say it’s devoid of cheap effects, but the problem is that it’s basically devoid of any other kind of effect as well. A last-minute conductor swap from ailing music director Franz Welser-Möst to Adam Fischer also did the evening no favors, and a few overacting singers couldn’t salvage it single-handedly. This is the start of a cycle I’m planning on going to all of. I’m worried. This Ring got off to an inauspicious start, with loud and out-of-tune horn entrances in a heavy-handed Vorspiel. More like the Donaukanal than the Rhine. Despite the orchestra’s ever-impressive sound, the mushy textures, poor balance, and general shapelessness made this evening a trial. Things improved a bit over the course of the performance but this was really uninspiring stuff. I don’t want to blame last-minute substitute Fischer too harshly; it was surely the orchestra’s fault as well. Some individual moments worked, but just as many fell flat, and momentum was lacking. Earth to the anvil folks doing the dotted rhythm part: you were totally out of sync with the others. 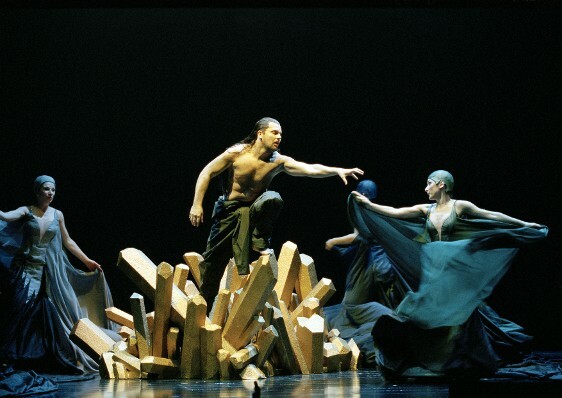 Sven-Eric Bechtolf’s production, designed by Rolf and Maria [sic in the program, it’s Marianne] Glittenberg, is minimalist to the point of being a void. Some static images are starkly striking, but there is no vision of the drama. A bare stage is adorned with some styrofoam rocks, and at least at this revived point there’s little characterization to fill in the story. This production caused conflict between Bechtolf and former intendant Ioan Holender, and Bechtolf at one point asked his name be removed from a revival due to the amount of rehearsals it was getting. His name did appear on the program last night, but I don’t think a whole lot of rehearsals were a factor now, either. The dress is Bechtolf’s pet early twentieth-century period, though what this means is never clear. A few other Bechtolf trademarks are present: Fricka’s glittery art deco gown, scattered female body parts (this time the Rheingold itself, previously he stuck these into Lulu). Alberich’s um, action with the gold and later casting of it into said female body parts suggests that his renouncing of love thing had major Freudian effects, but that’s all I got for meaning. The big set pieces are disappointing and anticlimactic, with only vague video projections providing Alberich as a serpent and a rainbow bridge. The interpersonal stuff comes across a little better. Though the interpretation is all utterly conventional, it is at least less static than last week’s Anna Bolena. The white suits and occasionally unintentionally comic blocking give it the feeling of a fin-de-siècle sitcom, which I’m going to dub Oh My Gods!. Also, Donner carries his hammer in a glittery hammer-shaped case. Just saying. As often happens in these sorts of evenings, a few canny singers noted the vacuum and attempted to fill it. Most notable was Adrian Eröd as Loge in the required Oh My Gods! sitcom role of Wotan’s Gay Best Friend, a shamelessly campy and over the top performance but still the most fun thing going on. Hearing his light baritone in this role was strange and while he managed it well I think I prefer a brighter tenor sound. Michaela Schuster is not vocally memorable but made an interesting Fricka with great attention to the text and acting details. 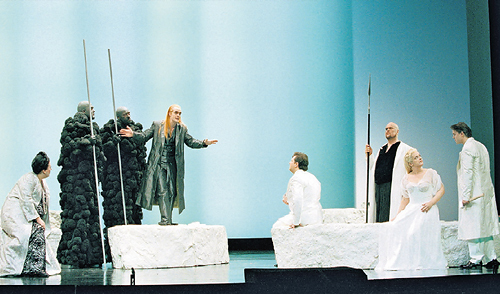 Günther Groissböck was a last-minute substitute for ill Ain Anger as Fafner and while the two identical giants covered in black foam balls do not allow for much in the way of charismatic performance, he sounded excellent. Tomasz Konieczny offered a solid, loud, reliable Alberich with an excellent Curse. He tore into the role with gusto (including his Rhine swimming, which seemed to involve an invisible Hula Hoop), more sleazy than sinister but vocally more commanding than Juha Uusitalo’s bland and underpowered Wotan. Nevertheless, Uusitalo gave a somewhat more dynamic and insightful portrayal than I have seen from him in the past. Anna Larsson sounded good in her signature role of Erda, and the supporting roles were filled well enough. However, a general musical slackness pervaded the evening. I hope things improve for tonight’s Walküre, which is my favorite of the Ring operas music dramas. I've seen the whole Cycle several times over the last years and with each new viewing appreciated it more and more. Bechtelhof focuses on the personal drama and takes an intimate, chamber like approach to the whole story. He shows us basically a family drama. This certainly relies heavily on rehearsals, however most of the cast has already performed it before. What actually made this Ring outstanding was conducting. For me it was one of the best Rings ever heard, and that was the main reason for hearing it over and over again. Let's Hope Walser Most gets better soon. The BBC version of your sitcom would have to be called Carry On Up the Rhine… Eröd obviously a shoo-in for the Kenneth Williams role.